Ice clouds (cirrus) in the upper troposphere and lower stratosphere influence regional and global climate, the water budget, as well as the chemical composition of the air in the UT/LS region. Natural cirrus clouds are subject to changes by aviation induced cloudiness (AIC) like contrail cirrus. Understanding the role of cirrus clouds in the climate system requires the determination of the link between the microphysical properties of their ice particles and the radiative forcing of the clouds. 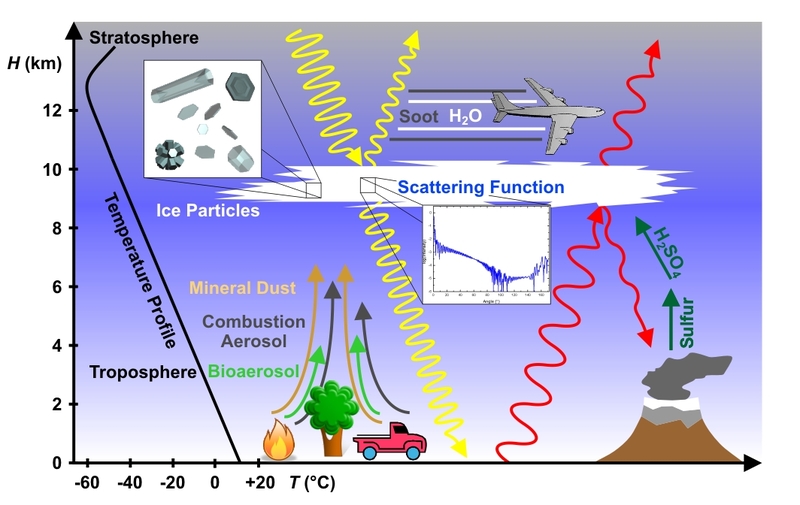 Fundamental knowledge of scattering, absorption, and polarization properties of ice crystals is also required for reliably retrieving the microphysical particle properties of cirrus clouds from remote sensing data. The link between microphysical and radiative properties of cirrus clouds is not as yet well understood and the influence of the shapes of ice crystals on the radiative budget of cirrus clouds is currently under debate (Baran, 2009; Kahnert et al., 2009). Here -besides remote sensing measurements- in-situ measurements inside cirrus and laboratory experiments are of particular importance for characterizing particle morphological and optical properties together with their variability.The problem of ice particle characterisation becomes even more complicated when internal structures of the ice crystal morphology (like indentations at the basal planes of columns (or hollow columns, Schmitt et al., 2006) and crystals with rough surfaces (Shcherbakov et al., 2006) have to be taken into account for the derivation of optical effectiveness. In order to quantify the microphysical and optical properties of ice clouds, with ice crystal populations that closely resemble those found in natural ice clouds, we started to run well-defined ice crystal growth and characterization campaigns at the AIDA cloud chamber. Size and shape distributions by FTIR extinction spectroscopy and single-particle light scattering measurements. 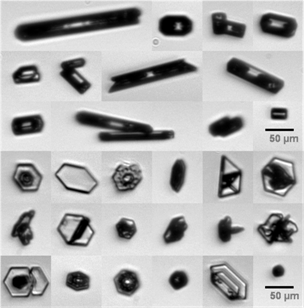 Stereoscopic imaging of individual ice particles and simultaneous measuremement of the angular scattering function with PHIPS. Forward-to-backward light scattering ratio and backscattering linear depolarization ratio δ with SIMONE.